Are you amazed to see how this beautiful tree continues to stand rooted to the ground, despite the wind pushing it in the opposite direction? So am I. In fact, this image set me thinking. How often do we come across people who are rigid, who are not only unchangeable, egotistical, stubborn, but also a challenge to work with- those who’d never ever bend from their stand, their outlook, their views/opinions? I wonder if they can ever evolve or grow that way. Do you like trees? 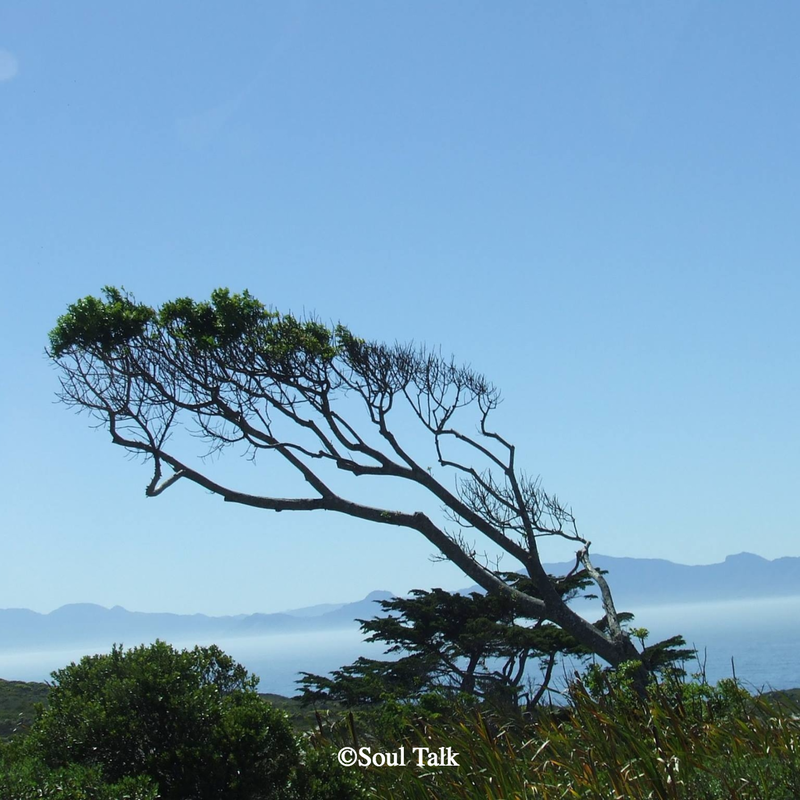 Have you ever noticed how they stand tall but know when to change depending on the directions of the wind? Some thoughts to ponder over, on this Thursday morning. Today, I am joining Parul Thakur with her post based on the theme #ThursdayTreeLove- a new photo feature on her blog. If you would like to play along, post a picture of a tree and link it back to her post. I like the analogy between the tree and rigid people. It is so true sadly and honestly, a part of me is worried because I keep finding more and more such people in places of prominence. While it may be a sign of power, rigidity of the mind scares me any day in a world where we need to be open minded. It is scary that the powers that be abound in such people who are ready to break but never bend. I see a sign of regression in the air as more and more people seem to be turning that way! There’s so many things to write about, but then time’s limited. Classic problem! Will look forward hearing from you then. Have you ever captured sunrise or sunset from Nandi hills or some similar location? I have been to Bangalore so many times and frankly, I haven’t explored anything. While earlier, It used to be once a year but now it’s once in 3-4 years. Even though I pass through Cubbon park and I love it so much, I have never been able to walk and explore. Another place I love is Sankey Tank. I’m not sure if I’ll be able to visit Nandi hill anytime soon. I think when you travel for work that is what happens most of the time. Cubbon Park is still beautiful although we don’t get to visit that part of the town often. Sankey’s Tank of course was my favourite spot when we lived up north. It was close to home and a place that we all loved to spend time in. That place too is changing now although the park next to Sankeys is still very much there and quite a nice one too. maybe next time you’re in Bangalore, you should keep some time aside for exploring around. Esha, all these trips to Bangalore weren’t for work. I agree that city has changed completely. I don’t think I should bring up the common woe -traffic! I’ll try to explore around few places. Any suggestions? Beautiful picture and lovely analogy. I always think of this – bending or breaking. I think that there are things we can’t be flexible like values and things where bending is fine. Thanks for linking with me. So wonderful to have you around. You’re right, Parul. I see your point. In this post, the reference is to people who cannot change when the time or the occasion demands it…they prefer to buckle under pressure but refuse to be flexible. Wow, this is fab! I loved how you weaved a post around this beautiful picture. I love how you’ve not just captured a beautiful image, but got us to think about ourselves too, Esha. I’d like to think I’m flexible and open, but I wonder if that’s how I come across to others. Thank you Corinne. I think I know what you mean…I am beginning to relook my views to assess if I actually am what I think I am. Introspections, to help me be a better person! I love the three lessons, Esha. I’m rigid too sometimes though when I realise I try to change myself. It’s very important to be grounded and open to change, else life becomes more difficult than it needs to be. Thank you Nabanita. I think unconsciously we tend to be rigid to our beliefs but I feel being flexible and open to another’s point of view always opens up more room for a better understanding of any situation. I love looking at trees, especially the ones that grow all twisted and crooked. They tell me a story about themselves, and in that, they teach me things like being rock solid in your views, not changing or bending because of the forces of nature and the world around you. And, to stay firm, despite all the bashings you receive from the world. Glad you think that way, Shilpa. Nature has that kind of effect on many of us. What peace and solace we draw from it! Perfect! Loved the photo as well as the quote. Nice meeting you..
How is this tree carrying its weight? This photo makes me think. To remain in such a state, whether for a tree or a person, strong and deeper roots are pivotal. Yes, amazing how it is so gracefully balanced even though bent, no? Strong roots definitely helps. Beautiful tree and beautiful and profound message.